Initially, engineers thought that the mole had hit a rock. But in a DLR facility in Bremen, they’re using a replica probe, in a box containing a cubic meter of sand, to investigate the situation thoroughly. They’re hoping to find a solution, obviously, but that’s a difficult proposition when you’re on Earth and the mole is on Mars. Matthias Grott, HP3 Project Scientist. “We are investigating and testing various possible scenarios to find out what led to the ‘Mole’ stopping,” explains Torben Wippermann, Test Leader at the DLR Institute of Space Systems in Bremen. The InSight Lander mission was going well at first. There was some surface rock near the landing site, but the site itself appeared to be rock-free. The lander’s seismometer, SEIS (Seismic Experiment for Interior Structure) was placed on the surface without any problems. But when the mole was placed, and began its first hammering operation near the end of February, problems arose. At first the mole was making progress. But then it hit its first rock. It was able to hammer its way past that rock, but eventually stopped and wouldn’t go any deeper than 30 cm. Engineers are trying to understand what’s happened, but they don’t have much data to go on. They performed a brief hammering test with the mole on March 26th, and they’re using data from that test to gain some insight into the mole’s predicament. They have some images, temperature data, data from the radiometer and recordings made by SEIS during the hammering test to help them. The central question is what caused the mole to make such progress at first, only to stopped in its tracks? A rock is the obvious answer, but maybe not the correct one. “There are various possible explanations, to which we will have to react differently,” says Matthias Grott, a planetary researcher and the HP³ Project Scientist. One possibility involves the nature of the sand itself, rather than obstructive rocks. In order to hammer its way into the surface, the mole requires friction between itself and the sand its hammering into. Engineers think it’s possible that the mole has created a cavity around itself, denying itself the friction it needs to proceed. 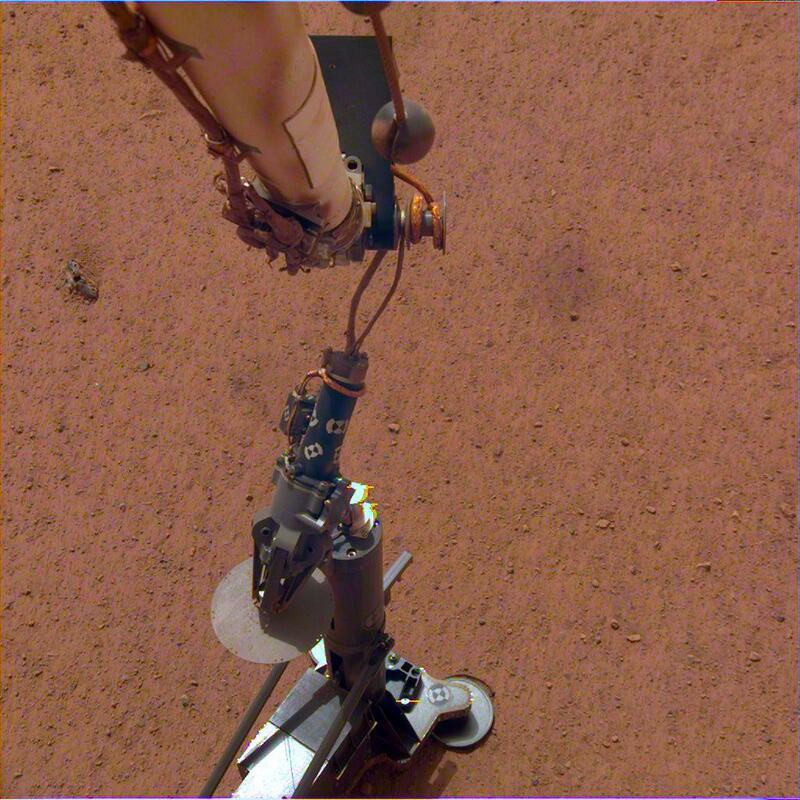 When the mole was being tested on Earth, it was tested in an analogue of Martian sand, and was able to hammer its way down to the ideal 5 meter depth with no problems. “Until now, our tests have been conducted using a Mars-like sand that is not very cohesive,” explains Wippermann. Now, they’re testing the replica in the lab in Bremen in a different type of sand. This type of sand is much more compactible, and they want to see if the mole has kind of “dug its own grave,” by creating a cavity around itself. They’ll also be placing 10cm rocks in some of the sand, to see if that can replicate what the data from Mars is telling them. As they perform various tests, they’ll record seismic data and see if any of the results match the SEIS data. “Ideally, we will be able to reconstruct the processes on Mars as accurately as possible,” said Wippermann in a press release. Once scientists and engineers find out what’s stopping the mole, they can try to find solutions. That’s where NASA will get more involved. The DLR designed and built the HP3 for the InSight Lander mission, but the lander itself was designed and built by NASA. And only NASA has a replica InSight lander in a test facility at the JPL in Pasadena, California. So DLR has shipped a replica of the HP3, or mole, to JPL. There, potential solutions can be tested that involve the lander, the mole, the support structure, and the lander’s robotic arm. Maybe it’ll turn out that the mole or its support structure can be lifted, or partially lifted, to solve the problem. In any case, don’t expect a quick fix. “I think that it will be a few weeks before any further actions are carried out on Mars,” says Grott.